South Africa’s Springbok Casino has a Golden Egg for you that will soon crack open and reveal a free bonus for you up to R3000! The Goue Eier will only open if you've made a deposit between April 1st and April 14th. If you have, you'll receive an email in which the Golden Egg will be open, revealing their bonus prize. If you haven't deposited yet it's not too late! 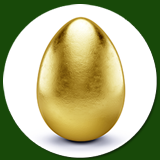 You have until April 14th to make your qualifying deposit and be eligible for the Golden Egg bonus. Springbok will add 150% to all deposits up to R3000 made until then and will include fifty free spins on the popular farmyard-themed Henhouse slot game from RTG. South African online casino uses Rands and provides service in English and Afrikaans. Available until April 14, 2017 only. With its lively country music sound track, Henhouse is a toe-tapping slot game where players can bet as little as a penny or as much as $125 per spin. Three scatter symbols start a bonus game where players choose from a henhouse full of chickens, each hiding either a prize (up to 3X multipliers) or a rotten egg that ends the round and sends them back to the barnyard. Henhouse is one of many games available online for laptop and desktop computers and in Springbok’s mobile casino for smartphones and tablets. Springbok Casino offers a huge selection of slots and table games from Realtime Gaming. All games are played in Rands at the popular South African online casino and customer service is available in either English or Afrikaans.